Keskuskatu 7, Helsinki, captured in 1931 by Olof Sundström. Image copyright by Helsingin Kaupunginmuseo. Restaurant Kestikartano was LOCATED IN A NORDIC CLASSICISM STYLE STONE BUILDING AT KESKUSKATU 7, IN THE HEART OF HELSINKI, which was designed by architect karl lindahl in 1921.
aarne ervi was already known for his modernist style, but the restaurant kestikartano was going to be something quite different than minimalistic clean lines with concrete and stone. inspired by the great house of pohjola from the kalevala mythology,ervi decided to use extensively wood as a material, particularly finnish pine wood (red wood) and created a traditional finnish log house interior in a grand scale. mainly round, bare logs were used all over the restaurant from floor to ceiling, with only some carvings as decoration. just some of the floor areas were covered with large natural stone slates and Even most of the furniture were made of pine wood, chairs and sofas with hand-woven wool covered paddings. There was another purely financial reason of using wood as well, since it was the only available low-cost material finland could produce by itself after the war. Kestikartano matchbox with the restaurant logo from 1948, graphic designer unknown. Private collection. regarding lighting design aarne ervi turned to his friend and colleague Paavo tynell, with whom he had already worked previously on several occasions. tynell´s own company taito Oy was going to manufacture all pieces, but instead of using standard taito-lamp models he designed custom made lighting fixtures especially for the restaurant. not much of the design process itself is known, but Tynell created numerous designs for the restaurant interior, including everything from ceiling fixtures to floor lamps and spotlights. Some of the designs were later taken into serie production by Taito Oy. Restaurant Kestikartano, Main Entrance Hall. Brass wall sconces by Paavo Tynell. Image from a postcard c.1946 published by Kestikartano, Private collection. on MATERIALS, TYNELL STAYED WITH HIS FAVOuRITE ones BY USING MAINLY SOLID BRASS, wicker AND wood, but HIGHLIGHTING the last two to accompany ervi´s interior. WICKER WAS USED IN VARIOUS WAYS ON SHADES AND WRAPPINGS while BRASS WAS USED IN ALMOST ALL PIECES. braided wicked shades on pendant lamps and floor lamps created rustic look and warmth to design mixed with polished brass. one of the most impressive pieces that tynell designed for kestikartano were at the "pohjan sali" (main dining room), where MOUNTED rectangular CEILING FIXTURES WITH PERFORATED BRASS shades CREATEd A spectacular "STARRY SKY"-EFFECT by reflecting light upwards. SOME TABLE LAMPS WERE ALSO MADE FROM ALMOST ENTIRELY WOOD WITH bent plywood and aspen SPLINT SHADES, WHICH WAS quite UNUSUAL FOR TYNELl who normally used brass as part of the structure. Color photograph from the Restaurant Kestikartano, early 1960s. Waiter wearing Finnish traditional folk costume. Ceiling lamp by Tynell with braided wicker shade and brass fittings. Image copyright by Museovirasto. Resturant Kestikartano, "Pohjan Sali", 1946. Wooden table lamps with wicker shades and brass bases, perforated brass ceiling lamps and ceiling lamps with braided wicker shades. Image copyright by Helsingin Kaupunginmuseo. In addition to interior and furniture designed by aarne ervi and lighting design by tynell, famous finnish ceramic factory arabia manufactured custom-made tableware for the restaurant. The main entrance hall ceiling was covered with a large textile work with hand-made pattern, made by the kalevala women´s association. finnish sculptor emil halonen also made a large bronze sculpture standing at the Louhen Piha called "pohjolan emäntä" (1945), also known as louhi. According to the kalevala folk mythology, she was a queen of the land know as pohjola and the epic house with the same name, which were the original source of inspiration for the restaurant. Louhen Piha, 1946. Large bronze statue on the left by Finnish sculptor Emil Halonen from 1945, named "Pohjolan Emäntä", also known as Louhi, who was a queen of the land known as Pohjola according to the Kalevala folk mythology. Image copyright by Helsingin Kaupunginmuseo. Louhen Piha, c.1950. Photographer unknown, Private collection. TOGETHER WITH ERVI, PAAVO TYNELL CREATED AN UNIQUE AND IMPORTANT EXAMPLE OF AN EARLY FINNISH MID CENTURY MODERN DESIGN, BY CREATING A MODERN INTERIOR WITH A TRADITIONAL FINNISH FLAVOUR, SOMETHING THAT GOT A GREAT POSITIVE IMPACT ON THE POST-WAR HELSINKI AND EVEN ENTIRE NATION BY USING IT´S OWN HISTORY AS A SOURCE OF INSPIRATION. It was also a proof of high CRAFTSMANship and quality of finnish industrial art, something that finland became especially known for internationally during the 1950s. The upper hall, Louhen Piha, 1946. Unusual floor mounted brass floor lamps with wicker wrapping and braided wicker shades. Image copyright by Helsingin Kaupunginmuseo. Pohjan Sali, 1946. Image copyright by Helsingin Kaupunginmuseo. 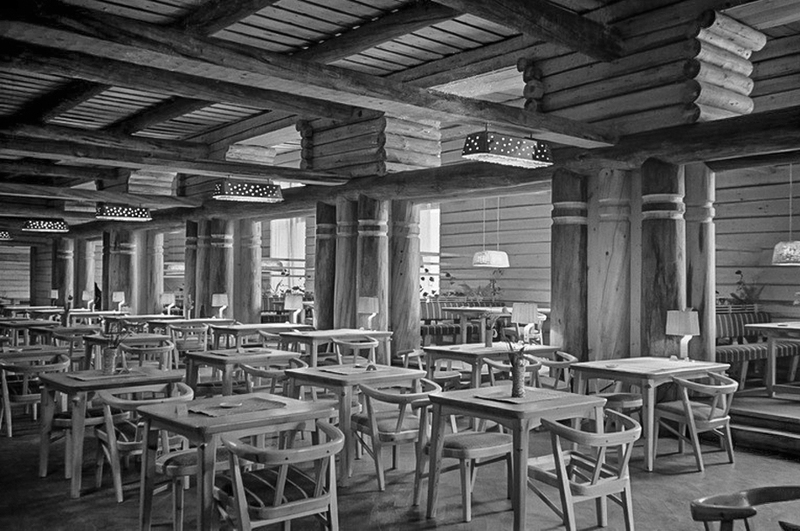 THE RESTAURANT KESTIKARTANO WAS ONE OF THE FIRST NOTABLE INTERIOR PROJECTS FOR AARNE ERVI, BUT ALSO AN IMPORTANT ONE FOR TYNELL, CHANGING HIS STYLE TO MORE NATURE INSPIRED AND DECORATIVE DIRECTION COMPARED To tHE PRE-WAR PERIOD WITH PURE FUNCTIONALIST DESIGN LANGUAGE. EVEN THE INTERIOR ITSELF COULD BE NOWADAYS POSSIBLY CONSIDERED TOO LITERAL AND FLAMBOYANT, PAAVO TYNELL´S PIECES FOR THE RESTAURANT COULD EASILY STILL STAND ON THEIR OWN IN A MODERN INTERIOR. The upper hall, Louhen Piha, 1946. Image copyright by Helsingin Kaupunginmuseo. Pohjan Sali, the main dining room, c.1948. Photographer unknown, Private collection. The restaurant was very successful from the start and especially during the 1950s and early 1960s by becoming almost like a national monument, a must see place for all tourists visiting helsinki, where TRADITIONAL FINNISH FOOD was served IN AN INSPIRING INTERIOR WITH WAITERS DRESSED IN TRADITIONal FINNISH FOLK COSTUMES. Unfortunately, in 1965 the property owner decided to replace the old building where kestikartano was located with a new office complex, and so the restaurant was closed in 1967. Most of the interior was demolished after the restaurant closed, but some of the furniture and lighting pieces were saved by private persons and kalevalaisten naisten liitto. Brass mounted ceiling lamp (nr.7) with five hanging "cow bells" was originally designed for the Restaurant Kestikartano in 1946. Image from a Taito-Tynell catalog, early 1950s. Postcard by Restaurant Kestikartano, featuring Pohjan Sali, early 1960s. Photographer unknown, Private collection. A view from Pohjan Sali, 1946. Bent plywood and splint shade table lamp, braided wicker pendant lamp with brass fittings. Image copyright by Helsingin Kaupunginmuseo. Sources: Kalevalaisten Naisten Liitto, Helsingin Kaupunginmuseo, Aarne Ervi-Tilaa Ihmiselle (Johansson, Lahti, Paatero, 2010).